It all began with a mushroom. As a teenager, Sarah’s Art teacher was so impressed by her pastel drawing of a mushroom that she persuaded her to take Art at A-level. Already a talented student of music, she found a way of pursuing both subjects by taking a degree in Music and Art at the College of Ripon and York St John followed by working as a Graphic Designer and Music teacher. So where does the gardening come in? 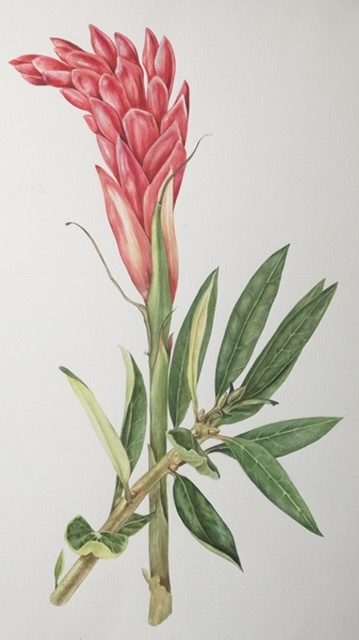 And how did Sarah end up working in water-colour, producing such botanically accurate illustrations? It was thanks to a number of courses – the RHS course at Capel Manor which turned Sarah into a qualified garden designer, a water-colour course with Bridget Woods and finally the botanical illustration course at Kew Gardens where she was taught by Christabel King. ‘Christabel taught me so much,’ she says, ‘especially the importance of keeping everything very clean and never using body colour such as gouache.’ Water-colour is a very difficult medium to use as there is little room for correcting your work and it is all about timing. 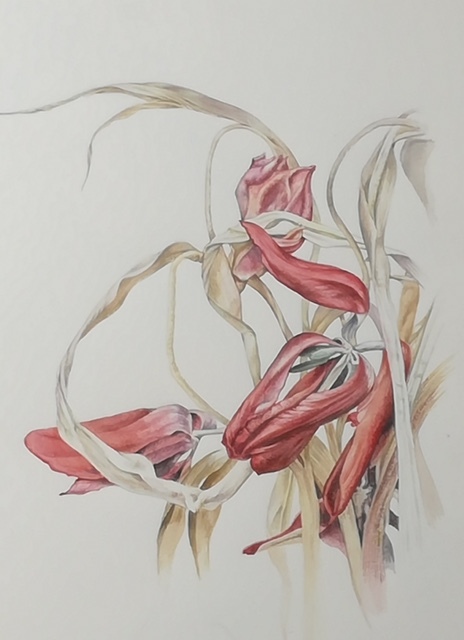 Sarah likes to map her drawing out first and work in layers to build up a depth of colour. ‘You have to be bold,’ she says, confessing that it can be stressful work until you reach a point where the painting ‘starts to smile at you’ and you can relax a little, knowing you are ‘on the last leg’. What is the last leg? It’s when you get out the magnifying glass to work on edges and details such as seeds within a pod. Like many BEAT artists, Sarah works in a spare room of her home, listening to music and taking breaks to practise viola, the instrument that she plays in the West London Sinfonia and still teaches, along with the violin. Although she sometimes daydreams about a huge sunlit studio in the South of France, she is happy in the Ealing community and has lived in the same house since her daughters were born, some 27 years ago. Is there one particular artist who has been an inspiration to Sarah? As a young graphic designer, working on labels and packaging, she was asked to emulate the style of various artists. One of them, Ian Beck, was a particular favourite; someone whose work she really admired — and as fate would have it, she is now in charge of looking after his garden!